Certainly, Father, much to criticize about the free market and consumerism is toward the top of that list. The fathers are very helpful in crafting our criticisms. 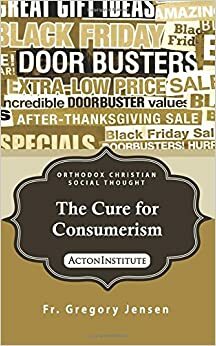 This is why when I wrote a monograph on consumerism I not only looked at the economic literature but also, and primarily, the fathers and the liturgical tradition of the Church. We can and should criticize the moral failings of the market. Or to be more accurate, the failings of actors in the marketplace. At the same time, the corrupt you mention is not limited to any one economic system or indeed any historical epoch. St Nelios the Ascetic writing in the early 5th century has similar complaints about the Christians of his time as you offer here. As I said in my original post, we have an obligation to care for the poor. The fact that we are wealthier–and indeed even though many of the poor are wealthier–does not change this. However, as I point out in my monograph, St John Chrysostom doesn’t recommend we simply give things to the poor. While there are some who are incapable of work and so of supporting themselves because of age or illness, those who can work should work. Not only that, their willingness to work is for the saint a precondition for receiving charity from the Church. Yes, the fathers tell us to care for the poor but they also–as Chrysostom does–tell the poor that they must care for themselves and their families through honest labor. This means that SOME of us fulfill our obligation to care for the poor by direct philanthropy. Other of us, however, care for the poor by creating businesses that make it possible for the poor to earn a wage. Often this wage is insufficient and, when it is, it is proper and right to offer the needed assistance. But, again, only on the condition that those who are able-bodied work. The poor cannot find employment unless someone–primarily business owners– creates jobs by investing their time, treasure and talent to open sustainable (i.e., profitable) businesses. When this happens, when wealth is created and the economy grows not only do the poor have the opportunity to leave poverty behind the natural environment is better cared for. Whatever might have been the other charms of pre-industrial society it was filthy and disease-ridden. Yes, coal and oil are dirty but so is wood and because wood is so inefficient relative to coal and oil (to say nothing of natural gas and atomic energy) we need more wood to do less work and our harvesting and burning of wood cause great harm to the environment. I thank God you work with the poor and have the wealth to afford the luxury of traveling to [an overseas mission field]. And sincerely, good for you and may God bless you for your efforts. Some indeed preach Christ even from envy and strife, and some also from goodwill: The former preach Christ from selfish ambition, not sincerely, supposing to add affliction to my chains; but the latter out of love, knowing that I am appointed for the defense of the gospel. What then? Only that in every way, whether in pretense or in truth, Christ is preached; and in this I rejoice, yes, and will rejoice (Philippians 1:15-18). So faithful to the apostolic command, I rejoice at your philanthropy and their exchange in the marketplace and technological innovation. As a Christian, how can I do anything else since in both cases the poor are served? As for how many coats I own, I have four winter coats. One dress coat I bought used, and lightweight, medium weight and heavyweight coats. While I’d rather have only one, the winters here are variable and can be so cold as to deadly. The clothing I need to go outside at -30 is inappropriate at warmer temperatures and my lighter weight gear useless when it gets that cold.